This review and more can be found on my blogI finished reading this book (Letters to my Daughters: A Memoir) by Fawzia Koofi about a week ago and it absolutely blew me away. I think I can honestly say that it changed my life. It’s such a heart wrenching story about a woman who grew up in Afghanistan. She has seen and been through so much in her life that it put my life in perspective. She was born in 1975, so she’s only 8 years older than me, but I can’t even imagine living her life. I don’t want to give a lot away in case you guys decide to read this book (and you should! ), but she lived through a war and the reign of the Taliban and was literally in death’s way every day of her life for several years.I think the thing that threw me was that when the Taliban was ruling in the early 2000s, there were so many rules that and laws that I couldn’t believe that I was reading about something that had just happened 10 years ago. It seemed like I was reading about something that should have happened FOREVER ago. For example, under Taliban rule, a woman was not able to leave her house without a male relative present. It’s just…. shocking that there are still countries in the world that live like this.Lastly, Fawzia Koofi is the strongest woman I have ever heard of. She has an unimaginable well of strength. She has gone through so much that I know that if I were in the same situations, there’s no way I would’ve been able to pull through. She is a huge inspiration to women all over the world.Read this book now!! This is a marvelous book which will hopefully be published in the US soon. It is a powerful account of the life of a woman born in 1975 in Afghanistan combined with an easy-to-digest political history of Afghanistan. Koofi, a present member of the Afghan parliament, is considering running for president of Afghanistan and her hope is that her "children's children will grow up free in a proud, successful, Islamic republic that has taken its rightful place in the developed world." This book is a wonderful step in that direction as Koofi shares her remarkable life story showing her passion to better the world around her. A flawed but interesting story. She has a fascinating tale to tell, I just wish she was more skilled at telling it. This memoir manages to simultaneously suffer from being overly pedantically factual and from being factually-challenged/inadequately edited.I can understand why a memoir might suffer from (and perhaps even be enhanced by) the fog of memory, and if she would just admit as much it would be fine with me. But no, she chooses to adopt a dry retelling, while contradicting herself right and left. Just two examples of the many ways her facts trip over themselves. She claims to have been born in 1975, to have a favorite brother 3 years older than herself, and then describes that brother (in a very important, heart-breaking section) as being 23 in 1992. The text leaves me no way to determine which of these facts is in error. Elsewhere she describes the Taliban's destruction of the Bamiyan Buddhas in a chapter titled "1996" without ever acknowledging that this event took place 5 years later. I know, I'm nit-picking, but this sort of factual sloppiness drives me crazy. She also recounts from memory with dry precision events that happen when she is only 2 and 3 years old, without admitting that these must have been re-tellings she had heard from others. Then on the other hand she gives us every harrowing detail of a journey looking for refuge, then another journey, and another, and another, without ever really telling us why they kept going back! She tells us of the harrowing deaths of loved ones, without ever giving us the chance to get to know the loved ones, they just show up at their deaths.Her account also suffers from a lecturing/preaching tone it falls victim to because it is purportedly being written to her two young daughters. And then the cynic in me, after repeatedly being told her mother's childhood joke that she would grow up to be president, realized that this was most likely just another example of an ambitious politician's obligatory self-revealing pre-political-campaign congratulatory memoir. Sure enough, she is currently running for president.Still, I somewhat hate myself for being so negative. This had such rich possibilities for insight; occasionally she finds them. I was so riveted with Koofi's book that I simultaneously wanted to devour the whole book at once and slam it down on the table in front of me. There were many points in her memoir where she recounted very infuriating moments in her life (thus, wanting to throw the book down), but I wanted so desperately to learn of how she succeeded in becoming a member of parliament that I couldn't stop reading.It's a beautiful book, and she is a very wise woman. Koofi has lived through so much and promoted so much positive change, I'm flabbergast. (view spoiler)[From growing up in a family where her father refused to speak to his daughters, to marrying a man who would take care of Fawzia's daughters at home while she worked... just consider that amount of societal change in a single generation. (hide spoiler)] Astounding. I also found myself submersed in the book because I grew up in a strictly westernised culture, surrounded by western ideals and media. Koofi proudly and compassionately expresses aspects of Afghan culture that I was completely ignorant of because of the western-world's view. I appreciate Islamic philosophies and ideals in a different way now (I did before, but admittedly I had a very rudimentary understanding of who the Taliban was prior to reading the book). Now that I've completed the book, I'm aching to read many other memoirs, biographies, and factual books about the east. I also want to read the Koran. I'm inspired, invigorated, and hoping with all my heart that Koofi continues to live and love in Afghanistan; it's important not just for their nation, but for the world. I have read other books about Afghanistan, but never cease to be amazed by what the resilient people of this country have been through. In this book dedicated to her beloved daughters, Fawzia Koofi, one of Afghanistan's first female members of parliament, and first female deputy speaker, details her dramatic and difficult life. She describes life as an unwanted girl in a large polygamist family, and the turbulence she lived through as her country went through the Soviet occupation, civil war, and the brutal rule of the Taliban. She tells her story with honesty, humanity, and great insight, and never shies away from the disturbing and shocking details. Particularly shocking is her description of the rule of the Taliban, and the terrible injustices they committed in the name of their extreme Islamic fundamentalism, destroying Afghan culture and dragging the country back to the dark ages. She obviously loves her country, and her Muslim faith, and has great hope for the future of Afghanistan and her daughters. I am very sorry to see that a woman who belong to a band of brutal warlords in Afghanistan, can fool Americans by "writing" a book. Mrs. Kofi is a doll in the hands of a fundamentalist band of warlords called "Jamiaat-e-Islami Afghanistan" (Islamic Society of Afghanistan) led by a dreaded man called Burhanuddin Rabbani who is accused of many war crimes and brutalities during civil war.She only exposes the Taliban, but supports the US occupation and the warlords.I have doubt if she has really written the book, because Mrs. Kofi does not have the required skills for writing a book, it is written by someone else and promoted under her name to use this book for propaganda purposes. The US govt. uses such women for its own agenda to show that there is a change in Afghanistan and that women are free after their invasion, which is a big lie.ONLY Malalai Joya is a real true representative of Afghan women, we are proud of her. This inspiring story gives a personal, first-hand perspective of the troubling years of Afghanistan's war with Russia, subsequent civil war, and then the Taliban years. Fawzia Koofi, now one of the most popular female politicians, expects daily that this day may be her last as she advocates for women, education, and freedom from poverty in a land where violence towards women has been commonplace. While some reviewers complained of lack of editing, I think the prose is more real and raw. It was like sitting in Ms. Koofi's home and hearing the story first hand over a pot of tea. Bravo to her courage and determination. I know I'll be watching the internet for news of her with whispered prayers for her safety and for peace and security and the advancement of women's rights in Afghanistan. My paradigm was shifted a few remarkable inches by Koofi's story. And she appears in other stories about womens' lives in Afghanistan as well (sorry can't remember which ones at the moment). Koofi's perspective is probably unique in this world. Koofi was raised in a traditional tribal household where women are considered to have little value but her life path is anything but traditional and as a result, she can reflect on the traditional world that forms her roots while embracing a very nontraditional and courageous present. As a member of Afghanistan's parliament, Koofi's perspective on politics, the Taliban and traditional ways is nuanced and insightful. Will change your mind and leave it there. I thoroughly enjoyed this read. I favour non fiction stories, especially those that deal with the human condition. 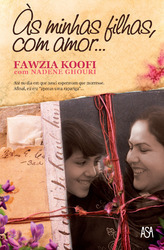 I was fascinated as Fawzia took me on my own private tour of her life as an Afghan woman. She shares how life changed so drastically under the Taliban rule - especially for women, and how she felt her country being dragged back to the dark ages. Regardless of how you feel about her politics or perspectives, you can't help but admire her ability to dream and then courage to pursue a better life for her daughters, and her countrymen. This is really an eye-opening story... For me it was extremely educating, I have to say that I personally had no clue about life or the people of Afganistan and had the completely a wrong idea. I am a mexican and was surprised at how much Afganistan and Mexico are alike... In their corrupt government, poverty, security issues... And how my feelings towards my country are so much like those of Fawzia Koofi even though we live so differently and have different religious views. I definitely recommend this book to everyone, it really is mind opening and culturally educating. I was given this book. Before reading it, I didn't know much about (or have much interest in) Afghanistan. But I was still completely absorbed by Koofi's inspiring story. She went through so much hardship - even if sometimes I wanted to yell at her (view spoiler)[(WHY wouldn't you go to Pakistan during the Taliban regime, where it was safe and your husband wouldn't have been thrown in prison for 3 months and gotten tuberculosis? )(hide spoiler)] - to be come incredibly, trail-blazingly successful. Excellent read!! What a woman, what a life!! Strongly recommend!! I saw her on the the John Stewart show...and I was so surprised to see John Stewart did not make fun of her, but I saw his respect for her...that left me wanting to know more about Fawzia Koofi. Fawzia Koofi - Fawzia Koofi is Afghanistan's first female Parliament speaker and a noted activist for women and children’s rights. Her forthcoming book THE FAVORED DAUGHTER will be released January 3rd, 2012 by Palgrave. Koofi is currently a leading candidate for the presidential elections in 2014 and has been quoted by the BBC, Time, The Washington Post, the Los Angeles Times, CNN, The Globe and Mail, and many others. Koofi was selected as a Young Global Leader by the World Economic Forum in 2009. Before getting elected to Parliament, Koofi was employed by UNICEF as a child protection officer from 2002 through 2004. The mother of two girls, she lives in Kabul.